Remodeling is like the equivalent of a wedding for your kitchen: lots of planning, lots of stress, lots of questions, and a whole lot of things that could just ruin the beauty of the whole thing. Fortunately, it doesn’t all have to be bad when it comes to remodeling your kitchen. As with any kind of renovation or remodeling, you need to start by taking certain things into consideration and asking yourself the right questions. When under a lot of pressure, this can sometimes lead to asking the wrong questions or focusing on things that don’t matter in the long run—like worrying about if those open shelves will go out of style by the time you get them installed. So, let’s take a deep breath and think about what we need to consider when it is time for a kitchen remodel. Loving or listing? One of the main reasons that people usually put the time, energy and funds into a remodel is if they are considering selling their home in the near future. They often go in, going for the trendier appliances, cabinetry, and look that they are sure is going to add value to the home and earn themselves a bigger payout in the end. Unfortunately, if you aren’t sure about selling within the next year or two, you could be sticking yourself with a kitchen that you won’t like. Realistically speaking, any remodeling that is done without selling the home in mind should reflect the preferences and lifestyle of the person currently living there. Sure, the pineapple wallpaper that you adore might not impress buyers but, if you aren’t selling, then why worry about it? Even more so, some experts believe that you should skip the deeper kind of renovation, if you plan on moving soon, and go for a cosmetic upgrade instead, which will shave a lot off the overall bill. Will it mesh? It might sound strange to say it, but will your remodeling plans for the kitchen mesh with the rest of the house? If you’ve bought an old farmhouse with gorgeous Victorian accents, that trendy kitchen might throw off the entire vibe of the house. If you are remodeling solely for yourself or your family, then, hey—it’s all down to your style and what works best for you. If you’re planning on selling the home, though, a gutted or oddly matching kitchen is going to lose you a lot of points with potential buyers. There’s a bigger market for antique stoves than you may realize, so don’t be too hasty when it comes to your remodeling. There is such a thing as over-improving your kitchen versus the rest of your home. It’s just like planning a wedding, really. Having dozens of doves whisk off into the sunset to a one-hundred-man choir playing your favorite song would be unquestionably awesome, but do you really need it? You can save a lot of money by saving what already works in the old kitchen and utilizing it in your final design! Know the people you’re hiring – Doing a remodel alone is hardly ever recommended unless you are a construction/design god in disguise who has plenty of disposable income. More than likely, you’re going to need contractors and designers to really bring your remodel to life, and they should be people that you can trust. Don’t be afraid to do some research: Scour the internet for reviews on your contractor, and really dig deep into your designer’s portfolio of previous works. Check their credentials and make sure you really read through any contracts or paperwork that are presented to you. Also, please remember, there’s really no shame in hiring a designer. There’s an odd psychology to working with people who are bringing your ideas to life: artists, writers, web designers and … well … designers in general. 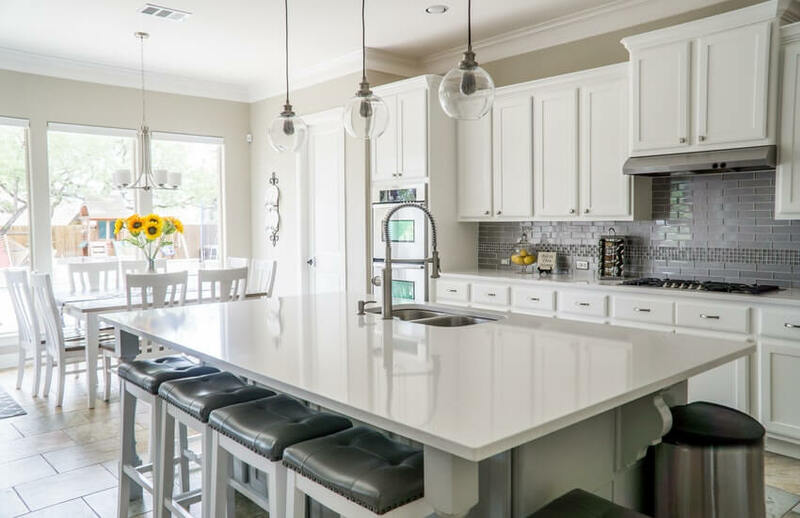 Experts say that a good three to ten percent of the remodel’s cost being spent on a good designer is an extremely fair price and will get you a veteran with the experience needed to make your kitchen shine. Can, or should, you expand? As more of an aside, something you should ask when working with an older house is “Can I expand?” Modern homes are somewhat spoiled by larger kitchen setups and more room to work with. In some cases, expanding on your kitchen could make it a lot more valuable and easier to work within. If the costs are reasonable, and it won’t bother the structural integrity of your home, why not see what you can play with? Really, any remodel is going to come down to asking yourself “What do I really want/need out of this process? Is putting in that faucet water filter going to make my life easier? Will the new French doors refrigerator make keeping it clean a little easier?” Whether you are selling your home or plan on staying, make sure you are doing your research and making the remodel work for those using the kitchen the most. Also, do yourself a favor and remember to breathe every now and again while looking through the fifty catalogs of cabinets. You’ll get through it, and, hopefully, have a nice kitchen to show for it in the end.